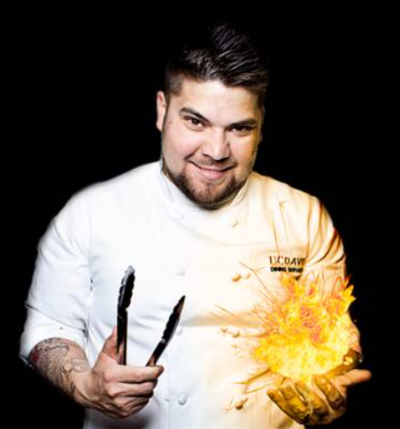 Growing up in Mexicali, Mexico, Chef Cesar Cienfuegos developed a passion for bold flavors and bright contrast in food. In a city well known for their street food and renowned for their deep-rooted Chinese culinary history, Cesar was influenced from an early age to investigate the endless possibilities of flavor. A mission he still peruses now as Head chef of Segundo dining in UC Davis and with every other culinary adventure – from catering for Margaret Mondavi, interning at the Kitchen restaurant in Sacramento, working with the Food science Labs at UC Davis, or running his own catering group. Chef Cesar has also worked with a number of local farms in collaboration to develop sustainable menus for special events and recipe writing with James Beard award winner Georgeanne Brennan. After enrolling into the well-known Cordon Bleu culinary school in 2013, Cesar started focusing on answering the question…What is the future of food and what is his role in that as a chef? That’s the question he wants to provoke in all people who eat his food…What’s next and what is his role in that. Chef Cesar will lead the session Why Insects are the Next SUPER FOOD that will Save the Planet – A Chef’s Perspective on Saturday morning.